Postcard CZ-806944 from Czech Republic shows Lipno, a village in the South Bohemian Region of the Czech Republic. 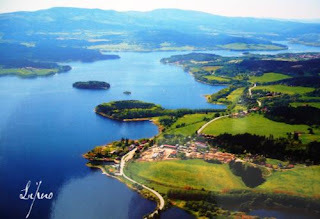 It is located along the Vltava River next to the Lipno Dam. The dam was built on the Vltava River between 1952 and 1959 as a flood control measure. With an area of 46.5 km2 or 4650 ha and a capacity of 306 million m3, it is the largest reservoir in the Czech Republic. Lipno Hydro Power Plant has two turbines with a combined capacity of 128 megawatts.